It’s been quite a while since I’ve posted. Life has been hectic to say the least. The Northeast survived Hurricane Sandy with terrible damage and devastation to our shorelines and throughout the tri-state area. Our prayers continue to go out to those who have lost so much. I feel fortunate having only lost a number of big trees and of course, power for a week. I know there are many folks not far from us that still don’t have power. The whole experience gave me a new appreciation for the simple things… electricity, heat, and gas stations that have no lines, and gas. I think we take these things for granted as we go about our day. Think of all the countries in the world where much of their population doesn’t have electricity or running water… or shoes. 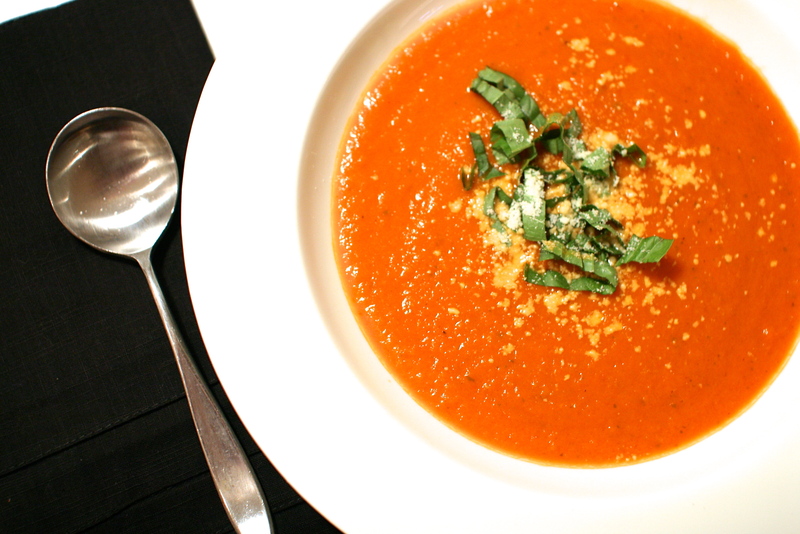 With all the stormy weather and colder temperatures, a big bowl of soup was in order. Ladled into bowls with a sprinkle of fresh basil and parmesan, this is a delicious weeknight soup you can throw together in a reasonable amount of time. Perfect when accompanied by a sandwich, it’s a great grab-and-go for lunches the next day, too. This soup is rich and creamy, but with no cream. Blending the softened vegetables using an immersion blender gives you the consistency of a cream soup, without the added fat and calories. I’ve found this works for butternut squash soup, as well. An immersion blender is super convenient, as you take the blender to the food, rather than ladling hot liquids into a blender. They are inexpensive and available at any housewares store. 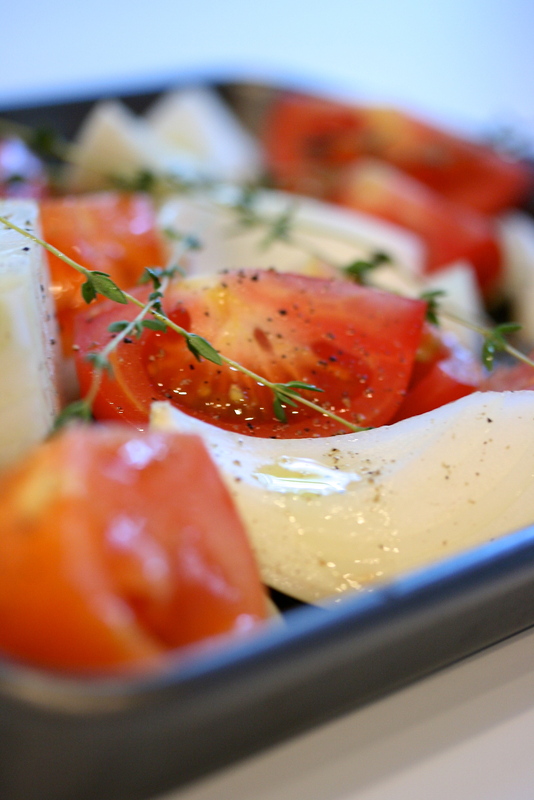 Place the quartered tomatoes, onion and whole garlic cloves with the fresh thyme on a baking sheet. 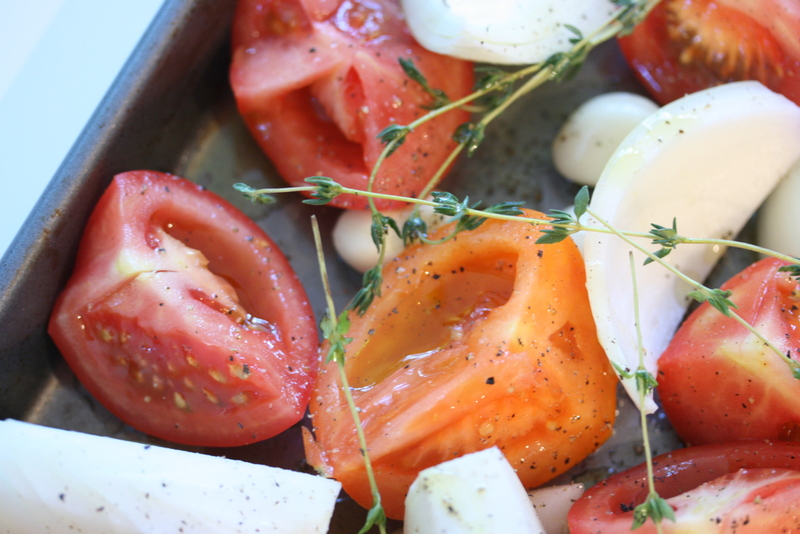 Drizzle the vegetables with 2 tbsp of olive oil and a sprinkle of salt and pepper – toss to coat. Place in the preheated oven for about 45 minutes or until everything is soft and the onions are beginning to turn a little golden on the edges. Heat a large dutch oven or stock pot over medium heat. 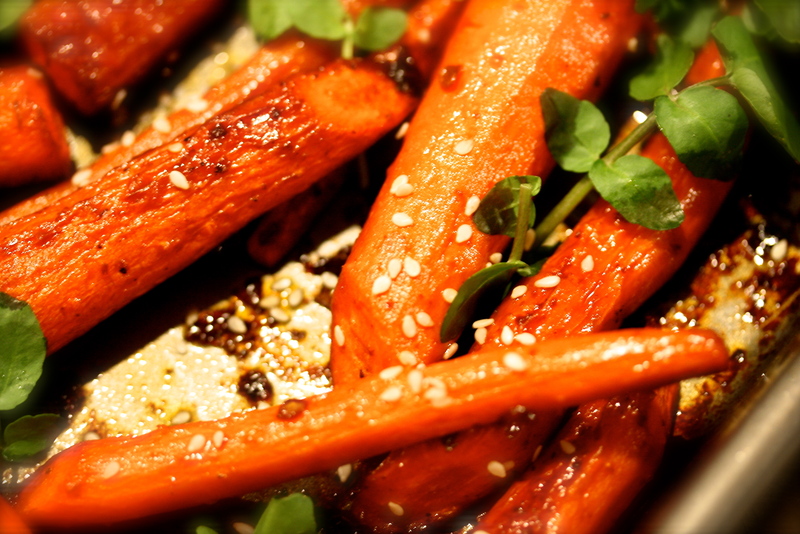 Add the remaining tbsp of olive oil and the diced carrot. 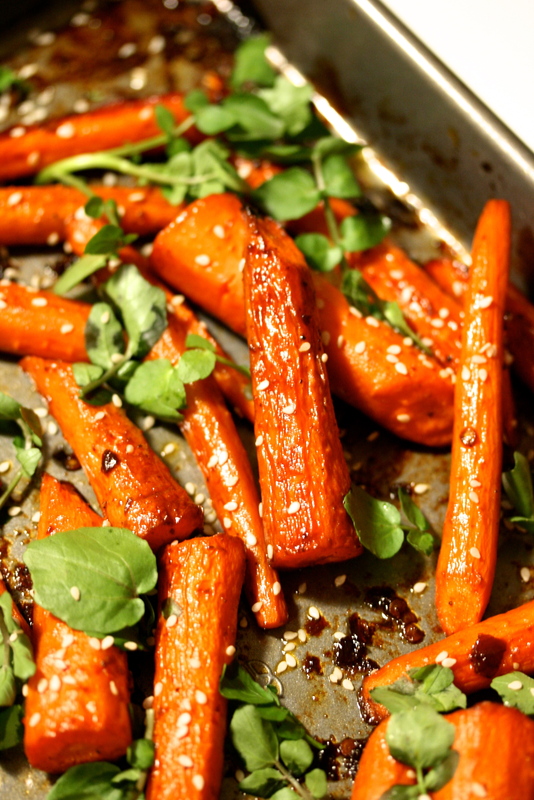 Sauté until the carrots begin to soften. Add the tomato paste and stir to combine with the carrots, about 2 minutes. Pour in the can of tomatoes and break them up with the back of a wooden spoon. Season with salt and pepper. 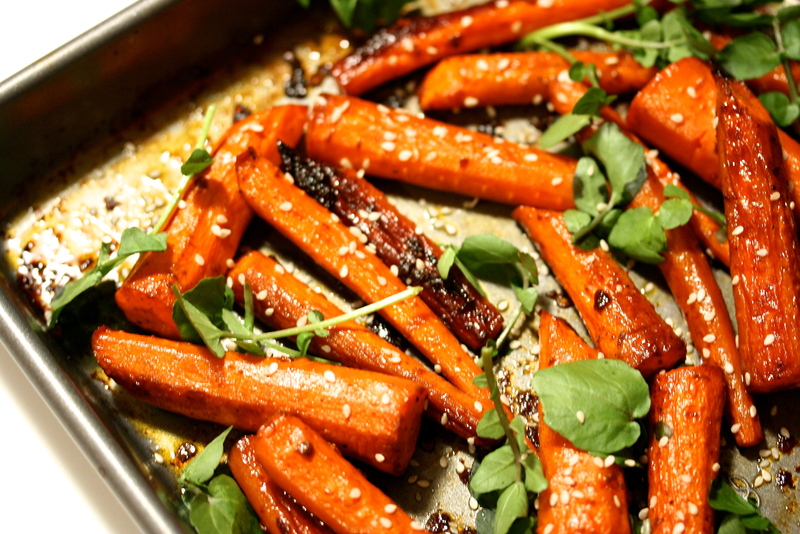 Add the roasted vegetables straight from the oven with the basil leaves, stir to combine. Simmer for about 20-30 minutes. Taste for reseasoning with salt and pepper. If the tomatoes are a little acidic you can add in the 1/2 tsp of sugar. Blend the soup using an immersion blender until nice and creamy. Serve with chopped fresh basil and a sprinkle of parmesan cheese… a grilled cheese sandwich would go nicely as well. * You could easily make this vegetarian by using vegetable stock in place of the chicken stock.